Children learn young that orange is the colour of a clean town. Because you can see the big refuse collection trucks coming from a long way away. 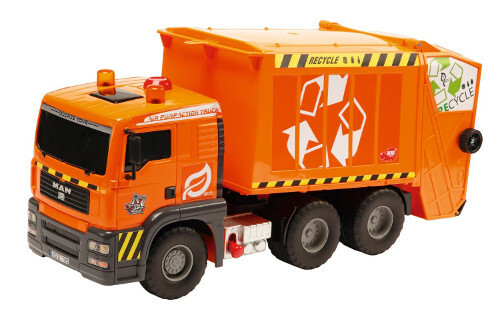 The Air Pump Garbage Truck from Dickie Toys shows in detail how a typical bin lorry from MAN works. The air pump function raises and lowers the container to pick up the rubbish. And it doesn't need batteries, so it looks after the environment and your wallet! The lorry comes supplied with a dustbin which can be filled with rubbish e.g. paper. This makes pretend play even more realistic. Encourage your child to learn how a town works and inspire understanding in unique technology.